Traiasca in memoria noastră Regele MIHAI I !!! Traiasca Regina MARGARETA I !!! Here from distant BRASIL !!! Requiescat in pace, King Michael! A fost o onoare de a-i fi contemporani și o bucurie că i-am fost compatrioți. 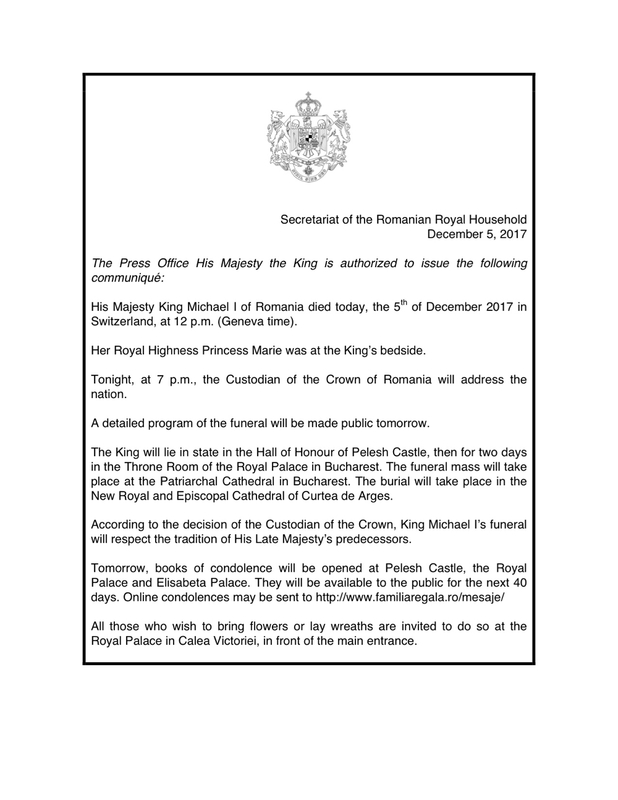 The news of His Majesty King Michael I of Romania death was very sadly received by us personally, and we send our sincere condolences. We hope the burden of your sadness will be lightened somewhat by the knowledge that millions of Romanian people and friends are grieving with You during this time of sorrow. riposi in pace servo di dio michele ultimo re di romania. Finalmente le sofferenze sonofinite e vostra maestà e libero, libero di riunirsi alla sua devota moglie,queen Anne. Cu mare tristezze am aflat de pierderea Regelui meu si al Romaniei , Majestatea Sa Regele Mihai I . Cele mai sincere condoleanze familiei Regale a Romaniei a Viitoarei Regine Margareta si a Altezei Sale Principele Radu. Fie ca Suveranul Romaniei , sa se odihneasca in pace vesnica in Imparatia lui Dumnezeu. Este cu mare tristețe să primești această veste, poate că măreția Lui se odihnește pentru strălucirea luminoasă continuă, sunt rugăciunile acestui subiect umil. Trăiască Majestatea Sa Regina Margareta. It is with great sadness to receive the news of the passing of His Majesty Michael I as he was an inspirational man and rightful monarch. My thoughts are with you and the Romanian people in your time of grief. Romania, and the whole of Europe’s monarchist community, has experienced a terrible loss. I am sure his good work will be continued by his heir and Household and he would be proud. Hopefully we shall see the union of crown and country in the near future. His Majesty was a very great and courageous man deeply dedicated to Romania. Crown Princess Margareta has the same commitment. Our hearts go out to her in her loss. Dumnezeu sa il odihneasca! Majestatea Sa a fost cel mai valoros reper moral pentru Romania secolului 21 . Un reper care ne-ar fi luminat cu siguranta si am fi fost mult mai departe ca dezvoltare si nivel de trai daca am fi avut curajul dupa Revolutie sa vedem adevarata valoare , Familia Regala care a facut atat bine poporului! Ramas bun Majestate! Gran persona. Lo conoci hace años en Madrid. ¡Que gran Rey y gobernante se ha perdido Rumania! United with his queen for eternity. Condolences to the Royal family. My sincere condolences to the Royal Family and people of Romania on the passing of King Michael. What a deep loss for you all and for your Country. In his quiet way King Michael was a towering man of faith, courage and integrity, a moral rock for Romania. We feel privileged to have known him as a friend. We remember with great happiness participating in the Diamond Wedding Celebrations in Bucharest, hosting him and the Queen in London and visiting them in their home in Switzerland, and their frequent visits to Caux. Our thoughts and prayers are with you all at this time and we send our love and deepest sympathies. It is with great sadness that the Embassy of the Oriental Republic of Uruguay has learnt about the passing of His Majesty King Michael I. We wish to convey sincere condolences to the members of the Royal Family and the Romanian People. May his soul rest in peace. So sorry about the death of His Majesty, a true example of dignity in adversity. My sincere condolences to the royal family, I have many pleasant memories of not only the king but the queen as well, these memories will stay in my heart forever. My warmest wishes go to you all. Lead, Kindly Light, amid the encircling gloom, Lead me Thou on! The night is dark, and I am far from home, Lead Thou me on! Keep Thou my feet; I do not ask to see the distant scene; one step is enough for me. I was not ever thus, nor pray’d that Thou shouldst lead me on; I loved to choose and see my path, but now lead Thou me on! I loved the garish day, and, spite of fears, pride ruled my will: remember not past years. So long Your power hath blest me, sure it still will lead me on, o’er moor and fen, o’er crag and torrent, till the night is gone; and with the morn those angel faces smile which I have loved long since, and lost awhile. Condolences for the Loss of His Majesty King Michael I of Romania-Royal Dynasty. of His Majesty King Michael I. He died Dec 5 2017 at 96 year old. This is a huge loss as His Majesty was considered the father of the Nation. His Majesty was deeply concerned about the state of his country and his people. People around the world responded with an outpouring of grief. GOD BLESS HIS HEART AND SOUL !!!! THE WORLD HAS LOST A GREAT MAN !!!! FOGADJÁK ŐSZINTE RÉSZVÉTEMET.Nyugodjon békében ŐFELSÉGE! So sad he died before regaining his country, hopefully his daughter will make amends. God rest the King, long live the Queen! The World was a richer place with King Michael, and it will be a poorer place without him. God save the King!